A bottle of deep, dark HaandBryggeriet Dark Force stout brewed in Norway. 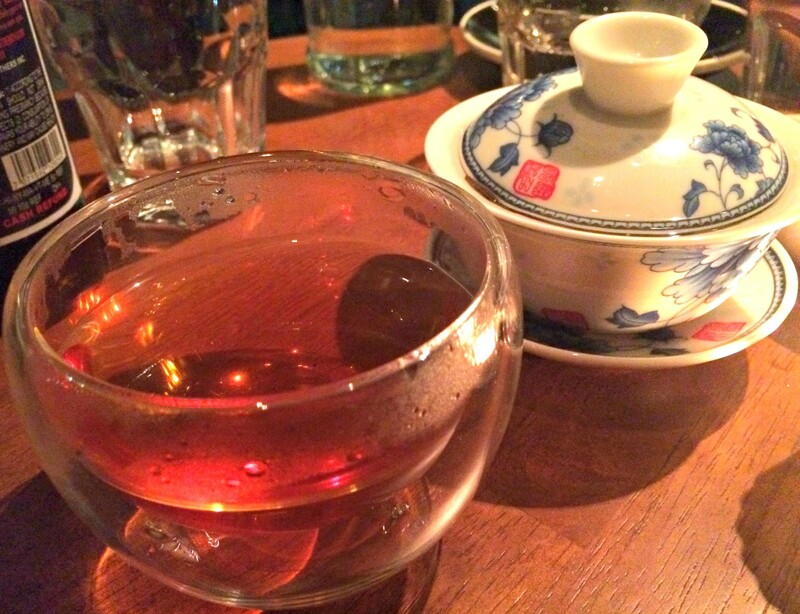 Tea with a natural wash of honeyed flavor. Intense, viscous drinking chocolate. They're all part of the latest addition to the Misery Loves Co. pantheon of gustatory experiences. Named Caffe Corretto for the Italian drink composed of espresso and a shot of booze — perhaps some amaro or grappa — MLC Bakeshop's new evening scene launched in October. My group of pals didn't go for the signature drink, but, as the name suggests, we found it to be the correct way to spend a Saturday evening. 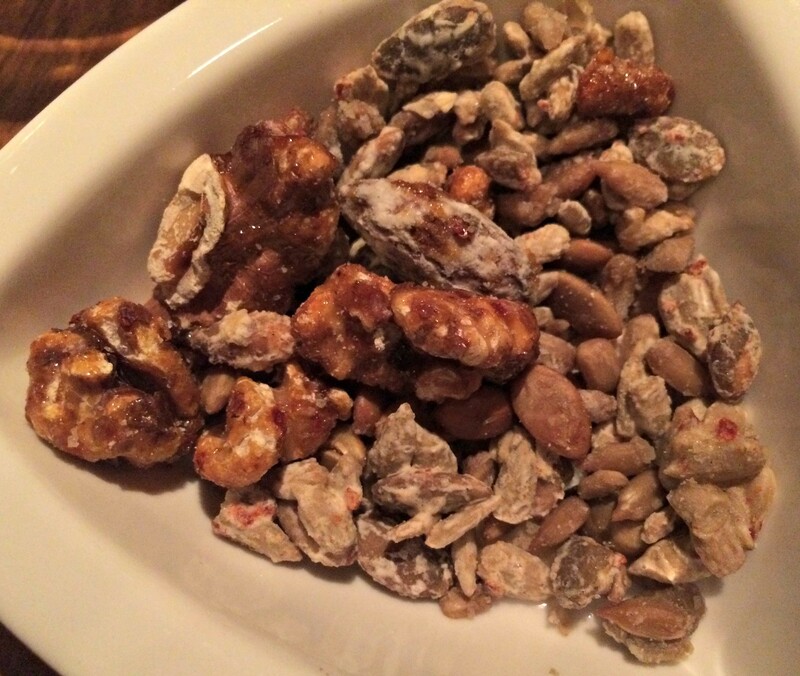 Upon our arrival, we were served a complimentary dish of lightly candied "seeds and nuts." The Caffe is open Thursday through Saturday until about midnight. We arrived at 7 p.m. and lingered a couple hours, running into other friends along the way. The secret may not be fully out yet, but a small crowd of Winooski residents was clearly hip to Caffe Corretto. Co-owner Laura Wade told Seven Days that she, husband Aaron Josinsky and brother Nate Wade added the new concept to provide guests a place to "either start their evening or end their evening, but also if they wanted a casual night there." We went with the latter, trying to make a meal for three from the concise list of small plates. For $12, we ordered each of the cheeses that are also available individually for $5. 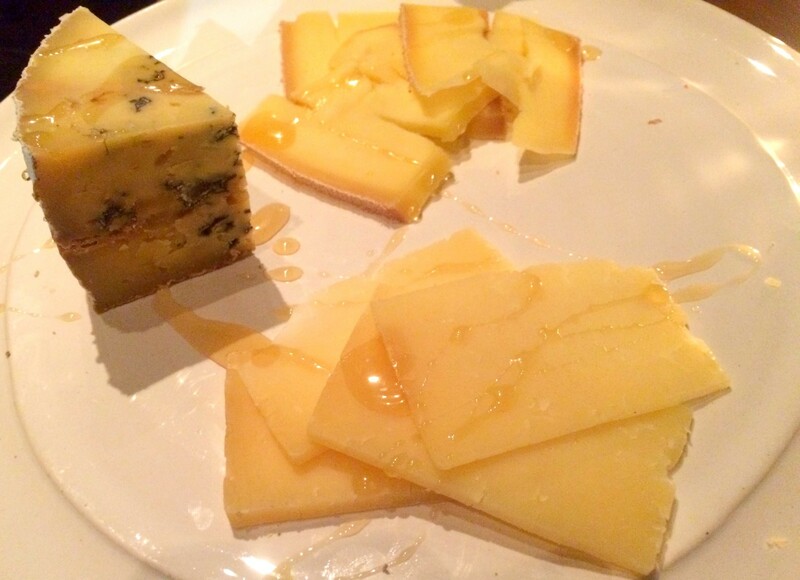 We were treated to the newly crowned "world's best unpasteurized cheese," Cellars at Jasper Hill's Bayley Hazen Blue, along with nippy slices of Spring Brook Farm's raclette and a few slabs of creamy Cabot Clothbound Cheddar. All were artfully drizzled with a housemade honey vinegar. I just wish there had been other accoutrements to optimally enhance each of the cheeses. How to choose charcuterie? Order one of everything. 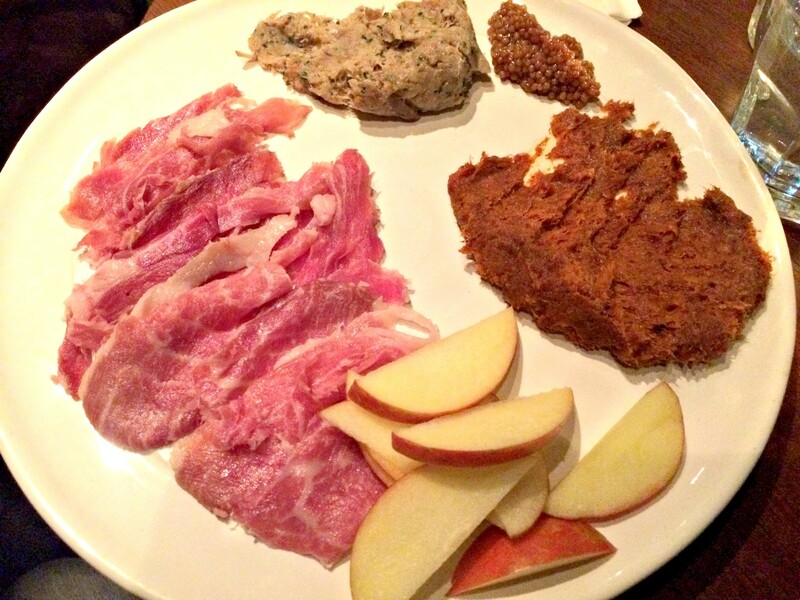 The charcuterie options are also $5 apiece. We ordered one of each. House "American prosciutto" was uncommonly moist — more lightly cured than mummified, as I expect prosciutto to be. Once I got over the surprise, though, I enjoyed the pork, which struck me as a raw, piggy cousin to Misery's beloved house pastrami. The spice on the nduja — a spreadable Italian pork sausage descended from French andouille — was a little less pronounced than I prefer, but the pork flavor came through admirably. 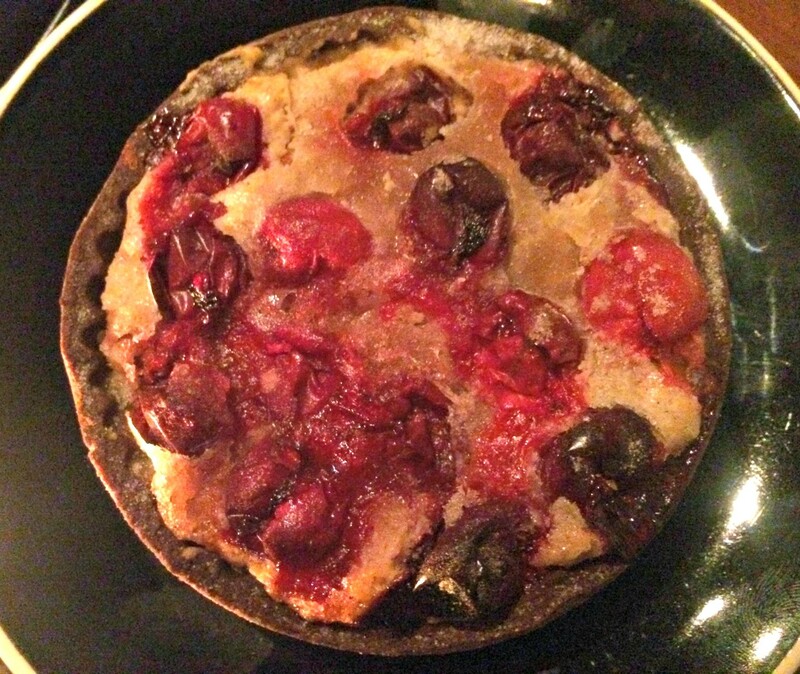 Both were served with slices of apple instead of the pickled pear mentioned on the menu. The apples were a perfectly acceptable partner to the salty meats, but I might return just to taste the pears. That is, if I don't go back for the rabbit rillettes first. My only complaint about the fatty, tarragon-flecked bunny spread was that I wanted more. With a caviar-like accompaniment of pickled mustard seeds, the savory confiture went far too quickly. 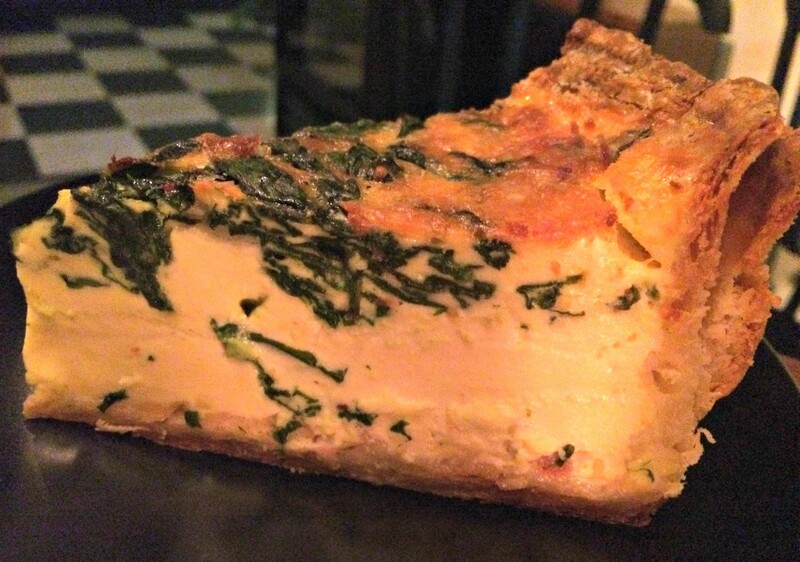 To make sure we had enough food (and to satisfy my egg-obsessed other half), we added on the $7 quiche, too. Would the phrase "liquid gold" sound like hyperbole? The filling was exceptionally light, like a slippery, moist soufflé. Flavored with bacon, spinach and cheddar, all was happiness besides some undercaramelized onions. If only there had been a way to make more of the crumbly, crispy crust. Since we were in a bakery, it was only natural to order some dessert. Sweet and savory bread puddings sat next to each other on the counter. I asked our very accommodating barista to heat up one of the former ($2.98). 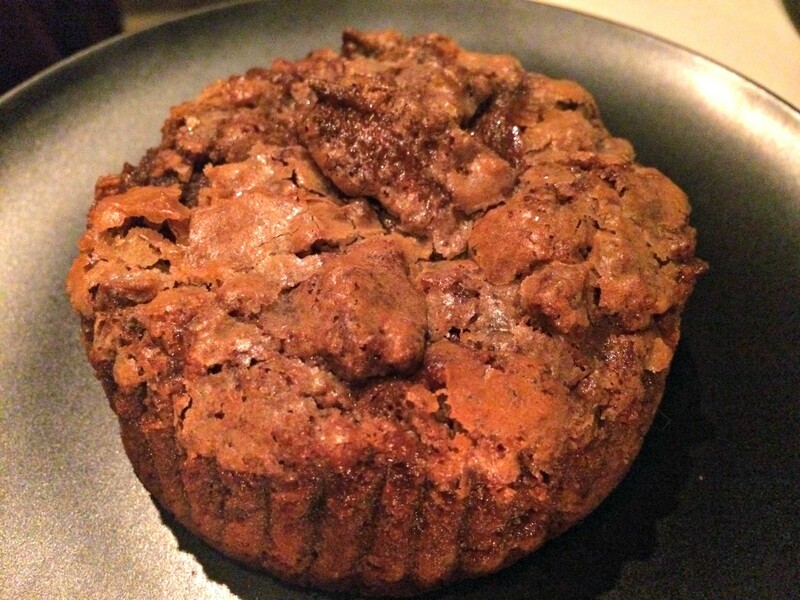 Though made from chocolate croissants, it tasted more prominently of almond than chocolate. It was also drier than I like my bread pudding. If I had thought of it as a giant cookie, I might have liked it more. But we ended on a high note with a darn-near-perfect pastry. A big round of chocolate short crust was stuffed with sweetened cranberries and a rich, chewy almond filling. At $6, it was serious investment, but it was a serious dessert. And I'm craving another one right now. In fact, I'm craving another night of relaxed, European-style atmosphere and upscale finger food. Here's hoping that tart is there when I return.